Do I Need a Print Kit? No. Almost any kind of ink will work but an ink pad is recommended for ease of use. Almost any kind of paper will work, but card stock is recommended, also for ease of use. We can mail a Print Kit (Ink strip, card and Taking a Great Print instructions) to you. Prints can be taken using ink strips. The quality of the finished keepsake is directly related to the quality if the print taken. Some prints are easier than others to obtain, but use the following tips to get the best ink prints. The living owe it to those who no longer can speak to tell their story for them. 1) REVIEW THE AREA Each fingerprint carries unique whorls, swirls, and arches. Locate the most interesting area to be inked or scanned. 2) INK THE PRINT Place an ink strip on a firm surface. Tap the finger on the ink strip a few times, making sure the fingerprint is evenly covered with sufficient ink. 3) COLLECT THE PRINT Place the print collection card on a firm surface. Tap the finger on the card using firm but not hard pressure. Move the card and continue printing until you have a good print. Never use lined paper and do not roll the finger. 4) EXAMINE PRINTS Take a look at the samples of UNUSABLE prints below. This is what you want to avoid. Each print has a problem that will reduce the quality of the keepsake. If you don’t see print details and lines, then we won’t either! 5) SCAN PRINT(S) To send prints electronically, you may use your desktop scanner to scan them as a Grayscale image (NOT black and white) at 600 dpi. Save the file as a JPG or BMP format. DO NOT resize. Using the crop tool, frame your selected print. For best results, be sure the image is orientated correctly (tip of the finger to the top of the image). Save the file to your device and send/upload with your order. How do I Collect Paw and Nose prints? Taking a high resolution digital photo is the easiest way to capture your pet's paw or nose prints and there is no mess! For best results use no flash and high resolution setting - photo must be in focus with sharp detail with good exposure (see above paw photo for example). Take several photos and send us the best ones. (Resolution recommendation- 300 dpi or higher or around 2000px x 1500px or higher. If unsure, use the highest resolution setting. JPG format works best). If using ink prints, we recommend using "baby/child-safe" or "non-toxic" ink pads and plain white paper. Black ink works best. Begin by studying the pawprint of the animal whose print is being taken. Select the area of the paw that is the most interesting. 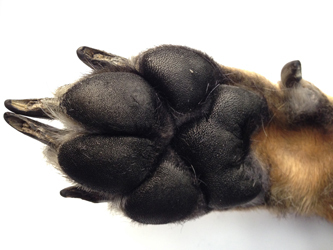 It is generally the area on the center of the paw. This is the area you will want to ink. Practice taking prints on any blank white sheet of paper. Lightly touch the inked surface twice and then press downward on the paper. Use more of a tapping motion than a rolling one. When you are satisfied with the look of the practice prints, place five good prints along the bottom of plain white paper or a white card. Artisans will select the clearest portion of the best print for casting. To scan your print- lay print flat against scanner glass (you may need to apply gentle pressure to scanner lid). Scan at 600 dpi and save in JPG format. Review your prints. If prints look blurry at 100% on screen, you will probably need to adjust your settings. Then submit your high resolution digital file in JPG format with your order. If your file is 5 MB or less, use the File Upload feature. For files larger than 5 MB, place your order, then submit your high resolution digital file in JPG format by email to info@tearcatcher.com. How are Thumbies Fingerprint Charms made? Our jewelry designers start with a digitized version of the print. 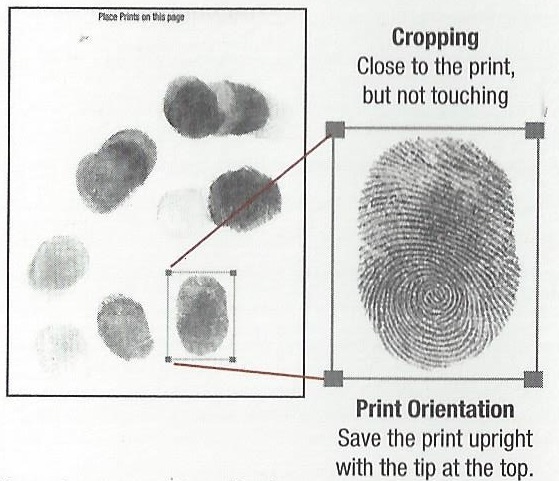 In the case of a fingerprint, these skilled artisans will select the most interesting portion of the print; for a handprint or footprint, they will clean up the area around the print in order to make it as clean and crisp as possible. Then, a computer assisted manufacturing device creates a wax mold based on that image. This traditional lost wax casting method is how the actual piece of silver or gold jewelry is produced. What kind of prints can I use? We can work with any print. Finger, hand, foot, paw, nose, and hoof prints. We've even created bighorn sheep hoof print charms. As long as you can produce the ink print, we will work with you to create your personal creation. Our charm process is surprisingly easy: 1) select your preferred piece of jewelry and place your order; 2) we will send you an Ink Print Kit to take capture the prints you’d like to use; 3) send in the prints directly, along with any desired engraving, to our charm designers, and they will begin creating your one-of-a-kind charm; 4) in approximately 4 weeks, you will received your finished charm(s). Please Note: If you already have an ink fingerprint, hand print, or foot print, you may scan it and upload a copy of the print with your order or send it to us in JPG format to info@tearcatcher.com by e-mail. That makes the whole process even easier! What occasions are Thumbies appropriate for? These amazingly personal and totally unique charms can be used to mark any moment in life – or to have or give “just because.” They are commonly created and given for births, significant birthdays, weddings, and memorials. These charms are truly the ultimate keepsake gift idea for a loved one – or for yourself. They are a touching way to remember a parent, spouse, sibling, child, or friend and to keep their memories alive and close to you throughout your life. How large are the charms? The “Standard” Thumbie charm size is 5/8" long x 1/2" wide. The “Grand” Thumbie charm size is 1" long x 3/4" wide. How long does it take to receive my charm(s)? Your ink print kit will typically be mailed within 3 working days of placing your order. We encourage you to send in your prints as soon as you’re able to. Production of your personalized charm will take up approximately 4 weeks from the date our design company receives your prints. Your completed jewelry will be returned via UPS (Ground service and insured) unless you select an alternative. Please allow 4 to 6 weeks total turn around time, just to be sure! Can I make a Fingerprint charm of a baby? A keepsake baby charm, we strongly suggest a baby footprint or handprint instead (babies don’t develop mature fingerprints until they are 3 years old). Please select a hand or foot print charm for babies and toddlers under age 3. What precious metal options are available? Tear Catcher Gifts offers the Thumbies charms in 3 precious metals: Sterling silver, 14k yellow gold, and 14k white gold Our charms are typically available in 4 surface designs: Full fingerprint, Rimmed fingerprint, Footprint, and Handprint. Please Note: We can also make charms with other prints to support pet lovers! Paw prints for cats and dogs, nose prints, horse’s hoof prints - we’ve even produced a hoof print from a big horn sheep. If you’re not sure, just give us a call. The Standard size charm includes 2 lines of engraving, with each line accommodating up to 10 characters and spaces. So, it’s not much space! Usually our customers decide upon a name and a date, or a word or two. (An optional 3rd line is available for an additional $10.00 charge.) The Grand size charms include the 3rd line at no extra charge. Can I include a birthstone on the charm(s)? You may select a small synthetic birthstone if you wish, or a genuine diamond, opal, or pearl to be included at the top of the charm (on the “bail” or hoop where it connects to a chain), adding elegance to each piece. You can see a listing of our birthstones on our Birthstone Gem Selector page. What if I already have an ink fingerprint? If you already have an ink fingerprint in hand, you may certainly upload that print with your order. Or you may send the print to us at in JPG format by email to info@tearcatcher.com. When you place your on-line order at www.tearcatcher.com, we will promptly send you an e-mail confirmation about your order. How do I SCAN the print? To reproduce your fingerprint, hand print, or foot prints accurately, we ask that you scan your print at 600 dpi and save the print as a .jpg file. Crop the image closely if possible to the print. Send your best print. And finally, title the .jpg file with the name of the printee. If your piece is tarnished, first try cleaning with a jewelry cloth. Often times, simply polishing the keepsake will return it to its original shine. If heavily tarnished, remove the tarnish with a liquid tarnish remover following the manufacturer’s instruction. It only takes a second or two. Never submerge jewelry with stones (synthetic or genuine) or resin in tarnish remover or leave jewelry in the liquid for longer than a few seconds. Use a good silver cream polish to restore the shine and place a protective coating (and tarnish resistor) on your piece. These are available in most hardware and grocery stores. Again, follow the manufacturer’s instructions. If you would like to have your keepsake plated so as to eliminate the tarnish and the possibility of an allergic reaction, be sure to request this upon ordering. If your piece has already been purchased, you may return the charm and plating can be done for a minimal charge (plus shipping). Most people have no problem wearing sterling silver. However, a small percentage of the population has metal allergies and reacts to the alloys used in sterling silver. When worn, their pieces quickly tarnish, turn colors, and in severe cases, cause a skin reaction. If this happens, we can plate any sterling silver piece to make it hypo-allergenic.